Helen Clark former Prime Minister of New Zealand and Administrator of the UN Development Program is one of four female candidates to be the next UN Secretary-General. Credit: UN Photo/Loey Felipe. UNITED NATIONS, Apr 14 2016 (IPS) - After hundreds of questions were posed to nine candidates vying for the role of United Nations Secretary-General this week, a lasting question remains; will the UN’s new leader stand for the powerful or the powerless? The selection of the ninth secretary-general of the United Nations has been seen as a chance for change within the 70 year old global organisation. Some see 2016 as the time for the first woman to be chosen to lead the organisation which represents over 7 billion people. Others believe that it is time for the selection process to become more open so that all of the UN’s 193 member states get a say in who is chosen. Historically it has been the five permanent members of the UN Security Council – China, France, Russia, the United Kingdom, and the United States – which have ultimately decided. The latter concerns were in part addressed this week, with the nine candidates who have so far announced their candidacies answering questions from the UN’s 193 member states, civil society and the media during an open selection process. Four of the nine candidates are women, also raising hopes on the gender equality front. Oxfam Executive Director Winnie Byanyima told IPS that the next Secretary-General should not only be a woman, but that she should also be a feminist. “It is time for the next Secretary-General of the United Nations to be a woman,” Byanyima told IPS. “She must also be a feminist, promoting women’s rights and gender equality, she must stand up for the poorest and most vulnerable,” said Byanyima. Natalie Samarasinghe, Executive Director of the United Nations Association UK agreed that the Secretary-General should be a feminist but said that the process should be open to women and men from all countries, adding that she would still love to see a woman selected. “I think that it’s appalling a sign of how bad the process is that we haven’t had good women seriously considered in the past,” said Samarasinghe. A custom at the United Nations means that it is considered to be Eastern Europe’s turn to provide the next Secretary-General, however Europe is the only continent which is split into more than one group, making this custom open to challenges. Two of the nine candidates so far are from outside Eastern Europe. Samarasinghe said that she hoped to see more geographically diverse candidates emerge. “It would be massively remiss of states not to put forward a developing (country) candidate,” she said. Carne Ross, the director of Independent Diplomat told IPS that the nationality or gender of the candidate is not the most important issue. “What really matters most is somebody who’s strong who’s smart and has got the courage and the judgment to stand up to some of the unhealthily dominant powers at the UN,” said Ross. Ross said that he believes it is still unclear whether the new more open selection process will ultimately result in a better candidate being selected. However Samarasinghe said that the more open process was important because it reflected on the UN more broadly. “There is a huge onus on institutions to become more transparent and inclusive,” said Samarasinghe. You have the UN which goes around the world promoting good governance having this hugely secretive process, so I think that the process is important,” she said. Samarasinghe said that many member states feel that “the vast majority of states are sidelined” in the selection process and that the more open process may help rebalance this relationship. “The UN and its Security Council must undertake much-needed reforms to become more inclusive, accountable, democratic, effective, and reflective of a world in which political and economic power has shifted,” she said. The current pool of candidates includes former heads of state and government and several current and former high level UN officials with experience working on issues representing the world’s poor and vulnerable, experience also reflected in their answers this week. 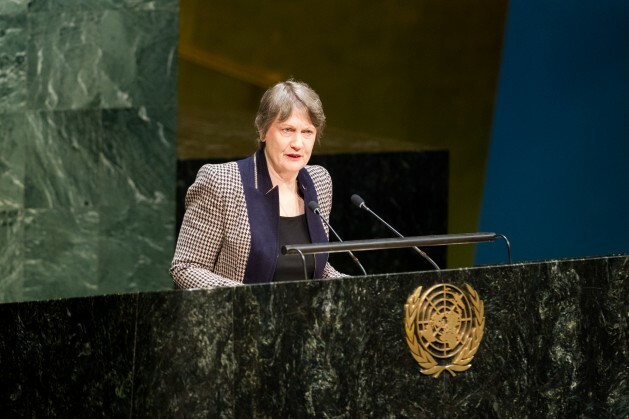 For example Helen Clark, former Prime Minister of New Zealand and Administrator of the UN Development Program told journalists of her intentions to be a “voice for the voiceless” and Antonio Guterres, of Portugal, former UN High Commissioner for Refugees told journalists of how his experience volunteering with the homeless had inspired his career in politics. Yet it remains possible that none of the nine candidates who have so far made their campaigns public will ultimately be chosen. “In the past it was the best strategy for the candidates to hang back and go quietly lobby in the P5 (permanent five members of the Security Council) capitals but this time around I think there is a transparent open process that they cannot ignore,” said Samarasinghe.